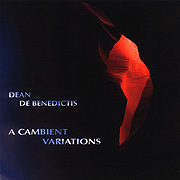 Dean De Benedictis has found his voice, and on A Cambient Variations (75'15") uses it on every track. Utilizing a variety of processing techniques, human vocal sound is layered into chords, shifted into choirs, looped into rhythms and stretched into unrecognizable textures. Obstruents become percussion riffs, grunts and groans make bass grooves and rhythm accents, while ethereal "oohs" and breathy "aahs" are transformed into a mysterious resonating atmosphere. Squeaks mutate into roars and whispered words resound under a cavernous echo as De Benedictis, using editing software, transforms elemental vocalizations into his singular digital soundscapes. A Cambient Variations transcends Ambient Music. With its unique character and original concept, the nine tracks each head out into uncharted experimental realms - each telling a different story. Taken all together the artist is revealed in his music.